In this post let us see how we can do the configuration on the screen(view) for change , rename the label , change the position , hide and display the fields with out any coding. In the sap gui version we need to change the screen. In the Web Ic version all can be achieved by configuration. If you want to add more validation then you need to write the code. Let us see how we can archive the following things. First find out what is the web-ic component and the view that you need to change. See the following screen shot. 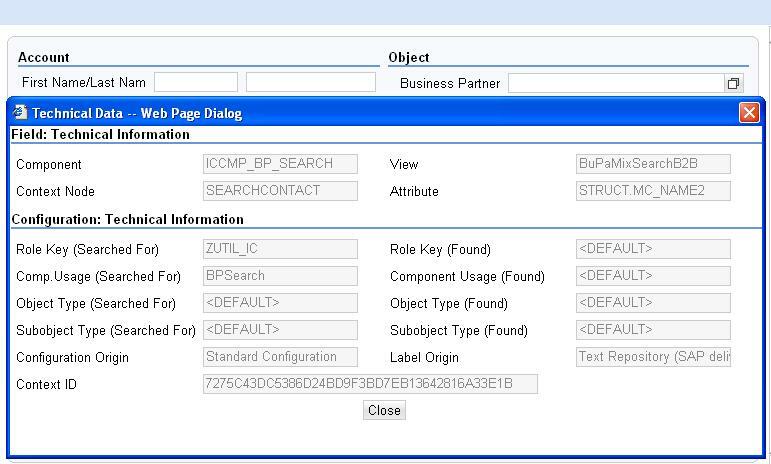 Sap web interaction center is new in the latest version of CRM. SAP moved from the win client to the web client. From CRM 2007 they moved all the user’s interaction to the web. Web-IC development is almost like web dynpro but you cannot use all the elements that you can use in the web dynpro. This has a different development tool. You have to use the t-code bsp_wd_cmpwb(bsp web dynpro component work bench) to view or mdoify or create the web-ic component. If you want to modify or create a new screens in the web-ic then you need to develop thru this work bench. Most of the time all you have to do is do a Enhancement to the existing component. All the screen in the web-ic are configurable. This is the best part you can rearrange or change the label and other thing in the screen with configuration. There is no coding at all.